Spanning the Alsea River only two miles west of Alsea, the Hayden Bridge is one of the oldest in the state. The span was either partially or totally rebuilt in 1945. Its portals, once rounded in design, have been enlarged to a more modern design to facilitate larger loads. Vertical board and batten siding flares out at the base, similar to Lincoln County covered spans. A daylighting window strip below the roofline on both sides of the bridge illuminates the interior. Alsea was a river community as early as 1850, known as Alseya Settlement. The name is derived from the name of an Indian tribe living at the mouth of the river, originally pronounced in three syllables. During the heyday of covered bridge construction, several of the covered structures were built close by on the Alsea River and its tributary. 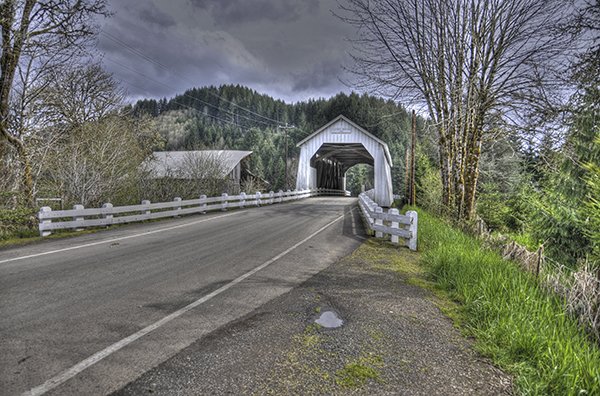 Oregon's last covered span on a primary state highway, the Mill Creek Bridge on Oregon Highway 34, stood just two miles away. Only the Hayden Bridge remains. HOW TO GET THERE: From Corvallis take Highway 34 southwest approximately 24 miles to Alsea and continue west 2 miles to Hayden Road. Turn left on Hayden Road and continue for several hundred yards to the bridge. Thanks to Google Maps for providing a great way to find your way!